SeaLink Group Sales and Marketing Manager Glenys Henry said, “Like most Kiwis, we want America’s Cup to be a roaring success for the country and city and are happy to work with Auckland Council and Panuku Development Auckland to play our part to ensure a successful event for Auckland”. At the same time, a new SeaLink ticket kiosk and passenger facility will be erected at the entrance of the ferry terminal and open to the public the week of 18 to 22 February. In March, the current queuing area for ferry vehicles on Wynyard Wharf will be closed and a new queuing area will be provided on Brigham Street itself. 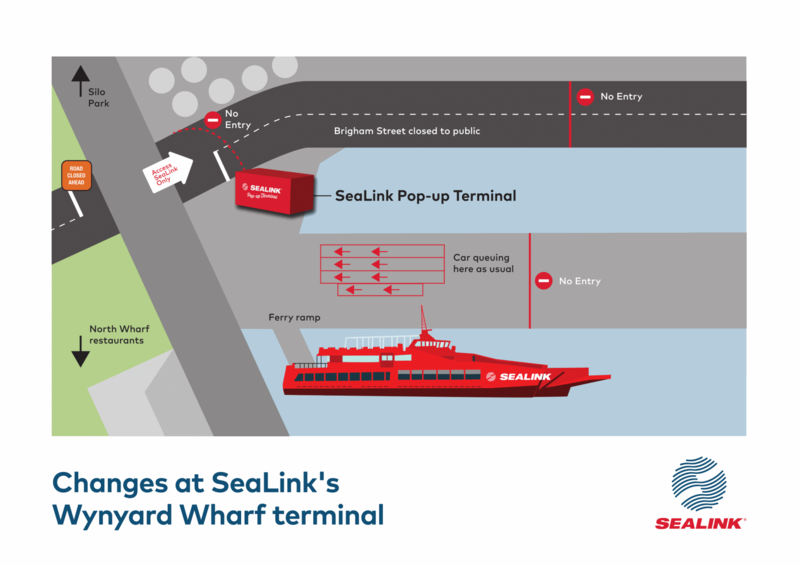 For further information, including a new terminal map, visit sealink.co.nz/sealink-terminal-update. Car ferry bookings can be made on www.sealink.co.nz. From now until 21 December, 2018 SeaLink advises there will be construction work happening on Donald Bruce Road and in the location close to the SeaLink Kennedy Point ferry terminal. Parking will be significantly reduced and traffic volumes higher than normal. To assist with reducing volumes and congestion on the road as well as the associated health and safety risks in the area, SeaLink requests all passenger and vehicle ticket sales to be booked at www.sealink.co.nz or by calling 0800 732 546. In addition, foot passengers should be picked up and dropped off at the 24-hour carpark at the top of the hill and not at the terminal. For the purposes of health and safety, it is important that at all times passengers and vehicle drivers follow the instructions of SeaLink marshals at Kennedy Point, as well as any signage. SeaLink, the indispensable link from Auckland to Waiheke and Great Barrier Islands will operate all its services under the SeaLink name from Monday 23 April, 2018. Now called SeaLink Logistics, previously the SeaLink Group’s logistics arm had been known as Freightlink Cartage, while the Group’s ferry service operated (and will continue to operate) under the SeaLink name. The company operates five vehicle ferries that move passengers, vehicles and freight between Half Moon Bay and the Wynyard Quarter to the Hauraki Gulf islands with around 6000 return trips a year to Waiheke and about 200 return sailings annually to Great Barrier. The company provides Waiheke and Great Barrier with essential freight services. SeaLink Logistics ships freight to the major building suppliers, supermarkets, breweries with outlets on the island as well as many smaller businesses. The ferries maximise volumes both ways and in return, transporting Island produce, recycling and even rubbish off the Islands. It is also upgrading much of its vehicle fleet at the same time as it re-names its freight operation. Sixteen new vehicles (including trucks and trailers) valued at over $1 million will provide the wide variety of services to the companies that do business on the islands. They will all appear in the striking red SeaLink livery in the coming months. The new fleet includes two Isuzu FVZ1400A 6x4 curtainsider trucks, two Isuzu FRR600 4x2 curtainsider trucks, a single Isuzu FVZ1400A 6x4 fridge truck, two Isuzu EXY 460 6x4 tractor units, an Isuzu FVZ1400M 6x4 crane truck and a long wheel base Mercedes 316 Sprinter van. There are also seven new trailers. SeaLink Logistics will continue to offer the same full freight service to the islands that Freightlink Cartage has provided, with the same staff. “Customers can deliver freight to our East Tamaki Warehouse for us to transport to the islands, or for Waiheke customers, we can pick up from around the Auckland area,” said Mr Gibson. The Springs Rd , East Tamaki depot is being up-graded between June and September – the operation’s low peak months - to create an even more efficient operation before it is despatched to the Half Moon Bay/ Wynyard Wharf ferry facilities. On Waiheke, SeaLink Logistics can provide a door-to-door delivery service, or customers can pick-up from its Tahi Rd depot. SeaLink Logistics also contracts to other freight companies who have goods bound for Waiheke or Great Barrier, but do not want to provide “the last mile” of delivery. SeaLink will continue to operate up to 17 return trips a day between Half Moon Bay or Wynyard Wharf and Kennedy Point, Waiheke, including a special dangerous goods service. There are return trips to Great Barrier Island up to five times a week in summer and three times a week in winter. Since 1960 SeaLink New Zealand (previously known as Subritzky Shipping Services) has been providing safe, fast and reliable services for vehicles, passengers, freight, heavy road machinery and bulk supplies to Waiheke and Great Barrier Islands, and contracted services to other Hauraki Gulf islands.